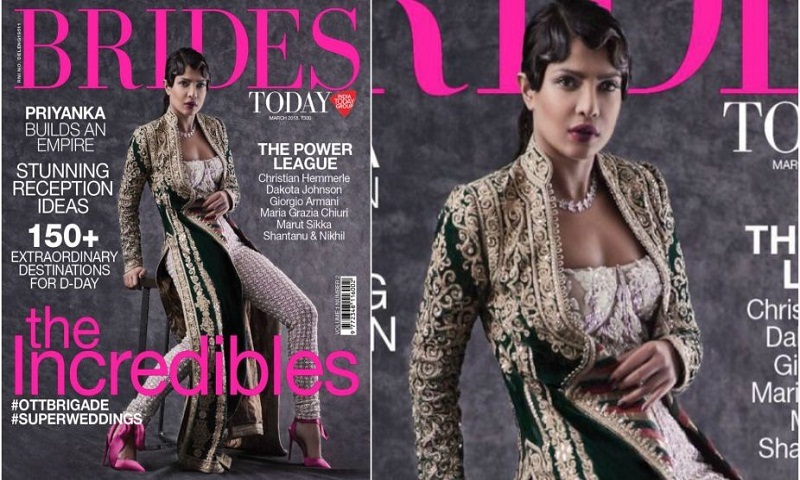 The gorgeous diva, Priyanka Chopra, made a splash on the cover of Brides Today. And when it comes to posing for magazine covers, Priyanka never fails to impress. The actor looked gorgeous in the photo shoot in encrusted royal green Rohit Bal jacket, a grey corset blouse from Manish Malhotra, and matching pants from Abu Jani and Sandeep Khosla, and pink Christian Louboutin heels. Her hair was styled in a Victorian style which gave the classic old world charm and her statement diamond neck piece completed her look. Recently, she also appeared on the cover of Elle magazine for its March issue and now she again turned the heads with her bridal look. On the work front, Priyanka is shooting for season 3 of Quantico in New York which will start airing from 26 April 2018.